American Airlines and United Airlines will soon put an end to the near-monopoly that Air New Zealand currently holds on routes from the U.S. to Auckland when both carriers commence services from their hubs in Los Angeles and San Francisco to New Zealand in Summer 2016. The expansion efforts undertaken by both carriers in the South Pacific underscore the importance of leveraging local alliance partnerships and cost-efficient aircraft to broaden their networks in previously unserved places. American will be venturing into New Zealand for the first time since the 1970’s while United will be returning to Auckland after a 13-year absence. Currently, Air New Zealand maintains roughly 90% of the seating capacity between the U.S. and New Zealand on its routes from Los Angeles, San Francisco and Honolulu to Auckland. Air New Zealand had previously held a full monopoly on routes to the U.S. after Qantas withdrew its Los Angeles – Auckland flights in March 2012, and enjoyed this position until Hawaiian Airlines commenced nonstop service from its Honolulu base to Auckland in March 2013. HAL presently comprises of the remaining 10% market share. However, from the lower 48 United States, Air New Zealand remains the sole competitor flying from Auckland to the mainland. Air New Zealand operates 4 weekly flights to Honolulu on 767s, 5 weekly flights to Vancouver on 777-200ERs, daily flights to San Francisco on 777-200/300ERs, 17 weekly flights on 777-200/300ERs to Los Angeles, 7 of which continue onto London Heathrow, and 1 weekly flight between Los Angeles and Rarotonga, Cook Islands. This will grow further next month when Air New Zealand launches its 3rd mainland market with 5 weekly services to Houston, starting December 15, 2015. Meanwhile, Hawaiian offers 3 weekly flights on Airbus A330-200s to Honolulu from Auckland. American and United’s new routes to Auckland reflect a broader strategy among their alliance and/or joint venture partners to strengthen schedules and frequencies between the US West Coast and Oceania. American’s new service to Auckland follows in the footsteps of previously disclosed plans to commence a daily flight to Sydney from its Los Angeles hub starting December 17, 2015. Also included in its Sydney announcement was a resumption of Qantas’ San Francisco – Sydney route on December 20, as part of an expanded joint business relationship with American. Qantas will initially offer five weekly services between SFO and Sydney and increase this to six in January 2016. United has also increased its Oceania presence recently with the addition of a daily flight between Los Angeles and Melbourne, which was launched in October 2014. United also operates nonstop service from San Francisco and Los Angeles to Sydney, and codeshares with Air New Zealand on a multitude of domestic and North American routes from its hubs in Los Angeles, San Francisco and eventually Houston. The resumption of services to Auckland also provides a much-needed palette to enhance itinerary options for Star and oneworld loyalty customers. For instance, customers can now enter the Oceania via Australia and exit via New Zealand and vice versa without having to toggle between loyalty partners and create separate reservations. Travel between New Zealand and Australia can be handled by Qantas and LAN for oneworld passengers, and on Air New Zealand for Star Alliance customers. Air New Zealand also has a stake in Virgin Australia, who similarly provides some feed on trans-tasman services. Star Alliance itinerary possibilities between the Americas and Oceania. 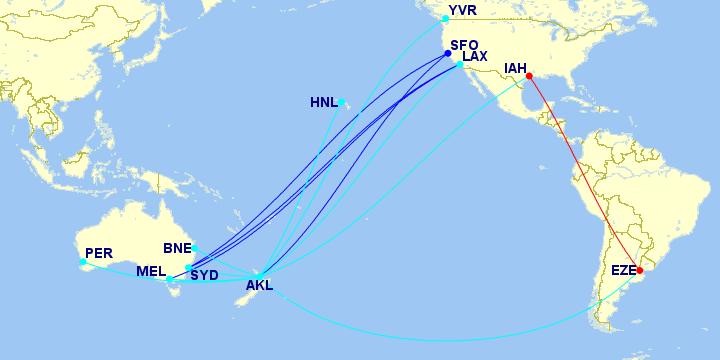 Routes shown in blue and red are operated by United Airlines, and cyan on Air New Zealand. oneworld itinerary possibilities between the US and Oceania per the Joint Business Agreement between American Airlines and Qantas. Routes shown in blue are operated by American Airlines, and red on Qantas. Note that Qantas does not have 5th freedom transport rights on its New York JFK – Los Angeles flight. oneworld itinerary possibilities between the Americas and Oceania (total). Routes shown in blue are operated by American Airlines, red on Qantas, and magenta on LAN Airlines. For the Australia and New Zealand outbound markets, the benefits are equally, if not more, substantial for travel to the U.S. and beyond. Now, Star customers can enter in San Francisco and return through Houston or Los Angeles, while oneworld customers can enter through Dallas/Ft. Worth and exit through New York JFK. United and American will both operate 787s to Auckland initially, although United has stated that it will up-gauge from an -800 series to a -900 series in high season. United’s 787-800 series aircraft seats 217 passengers with 36 Premium BusinessFirst seats, 70 EconomyPlus seats and 113 Economy seats, whereas its 787-900 series planes seat 252 passengers with 48 in Business First, 88 in EconomyPlus and 116 in Economy. United has stated in its press release that it will launch Auckland initiailly on a thrice-weekly basis beginning July 1, 2016, with an eventual increase to daily frequencies on October 28, 2016 for the peak IATA Northern Winter season, while also transitioning from the 787-800 to the 787-900 at that juncture. It is unclear whether or not United will maintain the same level of frequency afterward, but the carrier has stated that it will partner with Star Alliance carrier Air New Zealand on the same route once the route commences. American has opted for a different strategy by utilizing a 787-800 at startup, but opting for a daily frequency from the get-go in June 2016, several weeks ahead of United. American’s 787-800s feature 226 seats with 28 in Business class, 57 in Main Cabin Extra and 141 in the Main Cabin. American also has 787-900 series planes on order, but the delivery date and cabin configurations remain unclear. It is unlikely that American will deploy its -900 series on its route to Auckland as it is rumored that American’s 787-900s may retain a First Class cabin, which would differentiate it from the rest of its long-haul fleet. Other than the 777-300ER, which has kept a separate First and Business class product, American is in the process of phasing out International First on the majority of its long-haul widebody planes. American’s 787-800s carry roughly the same number of passengers as United’s 787-800s, but using a much denser configuration. United offers 22% more Business class seats than American on its 787s, and also roughly 19% more EconomyPlus seats. Meanwhile, American has a very high seating configuration in its main cabin on the 787-800 with 141 seats, which is 20% more than United’s 787-800 series and 18% more than on its -900 series. On American and United, the sole differentiating factor in Main Cabin Extra and EconomyPlus is extra legroom and pitch, which contrasts to the Premium Economy offerings on other international carriers. Air New Zealand offers an Economy Class “SkyCouch” that can convert a row of 3 seats into a couch using leg rests, and Qantas offers a Premium Economy class with a dedicated check-in and boarding access service, enhanced leg room, in-flight dining and noise-cancelling headsets. Product alignment between the US brands versus their international counterparts will obviously come with some distinctions in the Economy Class cabins. Competition is long overdue for US – New Zealand, and United has been waiting for the right opportunity. United has massively expanded its route portfolio from San Francisco over the past few years to reap the advantages of the 787 as its next-generation long-range aircraft. The Auckland announcement came in tandem with announcements to launch service to Xi’an and Tel Aviv, also utilizing the 787, in addition to its current service to Chengdu, a 787 that was launched in 2013. Even with Star partner Air New Zealand present in its two West Coast hubs in San Francisco and Los Angeles, United has been wanting to serve New Zealand on its own metal for some time. United last served New Zealand in 2003 before it cancelled its Los Angeles – Auckland flight in 2003, and also muted a proposed nonstop flight from Houston to Auckland that was scheduled to start in 2012. The route was inherited from its merger partner, Continental, utilizing one of the first Boeing 787 Dreamliners scheduled to be delivered to Continental (and subsequently, United). Although United blamed the cancellation on political reasons in the City of Houston, the more probable reality is that United desired to launch Auckland from its San Francisco gateway hub, and could capitalize on the 787 delivery delays to deploy the first batch of Dreamliners on more desirable routes within the post-merger United network. Now that the tide has receded, and United has found that it has ample 787s to move further down its wish list of destinations, the timeline is much more appealing. Further, United is perfectly content with allowing Air New Zealand to operate an ultra long-haul route into its Houston hub where United can provide domestic feed and short-haul feed while letting ANZ handle the rest. It is a model that American and Qantas have utilized at the massive Dallas/Ft. Worth airport 224 miles north and there shouldn’t be any reason why it wouldn’t work in Houston. For Air New Zealand, the competitive response from American is far more threatening than from United. The carrier prides itself on its strength in the U.S., particularly from Southern California, and American will no doubt be a formidable competitor. Alas, the time has come for enhanced competition to Oceania, and after many years of inertia, the leaves have been turned over and new colors are starting to show.